Wednesday Stock Report.... Dollar Drama and why You Should Care! Its been a slow day so I thought I would get the Wednesday stock report finished early. 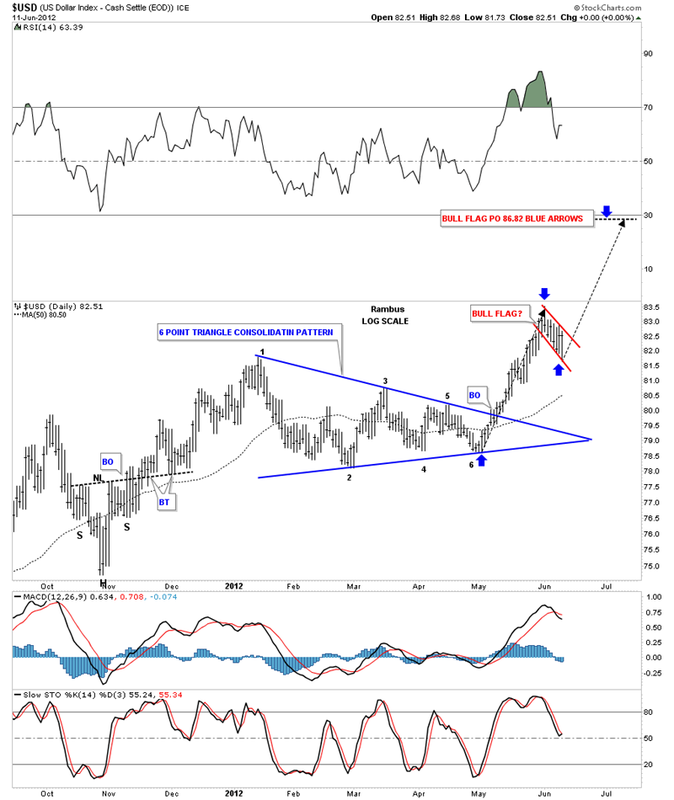 In this Wednesday stock report I would like to look at the US Dollar, as it plays a very important role to the big overall picture regarding so many markets. A strong dollar usually means a weak stock market or commodities. Its possible that the stock markets or commodities can move in the same direction of the dollar but in general they move in the opposite direction. So getting the big overall picture right for the US dollar helps us understand what we are up against in regards to the other markets. Lets start with the daily look to see what has transpired over the last 10 months or so. The dollar carved out a six point symmetrical triangle consolidation pattern in the first part of this year. If you remember the last reversal point, #6, was a little tricky when it broke down slightly below point #4. That was a little false move that paved the way for the big rally that followed. There is a possible bull flag that has been forming over last two weeks or so. It will either be a bull flag halfway pattern or the start of a bigger consolidation pattern that will chop around to the right side of the chart. If the dollar can take out the previous high then there is a good chance the red bull flag is the correct pattern. If it fails we might see a triangle or rectangle or some other consolidation pattern form. Something to keep a close eye on. The weekly chart is the look to pay close attention to. I’ve been showing this inverse H&S base before we broke through neckline #1. As you can see on the chart below the backtest to neckline #1 was a long drawn out affair that planted a seed of doubt when the price action dropped slightly below the neckline. Notice how the neckline came back into play, as support, once the price action got back above. For the last two months, after the strong backtest, the neckline never failed again and held support until the move higher began. Also on the chart above you can see where the dollar has formed another inverse H&S bottom, neckline #2. The possible red bull flag that I showed you on the daily chart is part of the backtest to neckline #2. A complete backtest to neckline #2 would come in at 81.35. The next chart I would like to show you is a weekly combo chart with gold on top and the us dollar on the bottom. There are several important points on this chart that are worth noting. First you can see the big inverse H&S bottom on the dollar chart that matches fairly close the big H&S top on gold. You can see they both broke through their respective necklines about four weeks ago. They are both in the process of backtesting those necklines. The other important feature on the chart above is where I have labeled H #2 on the dollar chart. That is the point where the dollar made a slightly higher low while gold was going near parabolic to it’s 1920 all time high. By the dollar not making a lower low at that point, while gold was making a much higher high, that setup a positive divergence for the dollar to gold. 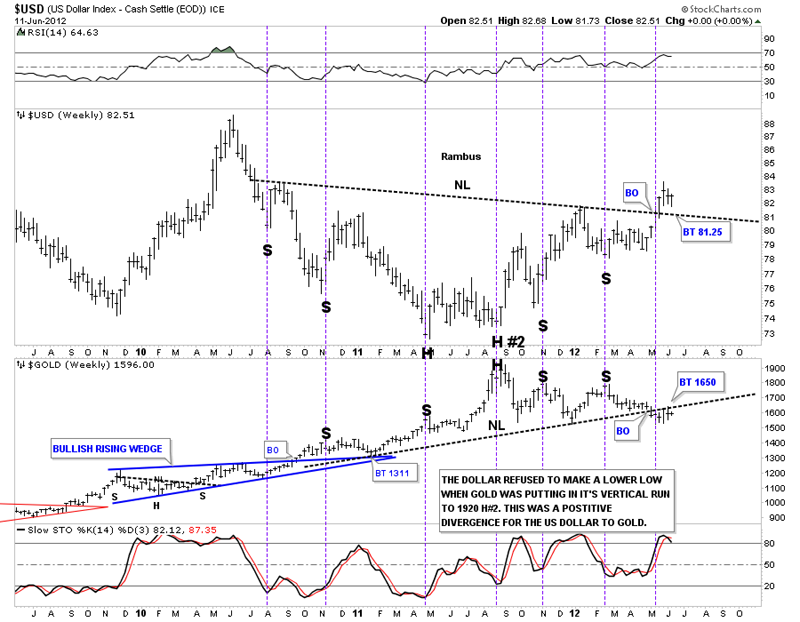 That was a strong inflection point for both the dollar and gold. As you can see on the chart above the dollar has been in a strong uptrend while gold has been trending lower. The next chart is a weekly line chart where I put the US dollar behind the gold price so you can see how they interact with each other. In April of 2006 is when gold crossed up and over the dollar and never looked back. What is obvious is that gold has been in a huge bull market as the dollar has been in a bear market. Since the dollar hit it’s low in 2008 it’s been chopping out to the right side of the chart failing to make lower lows as gold was making one high after another. 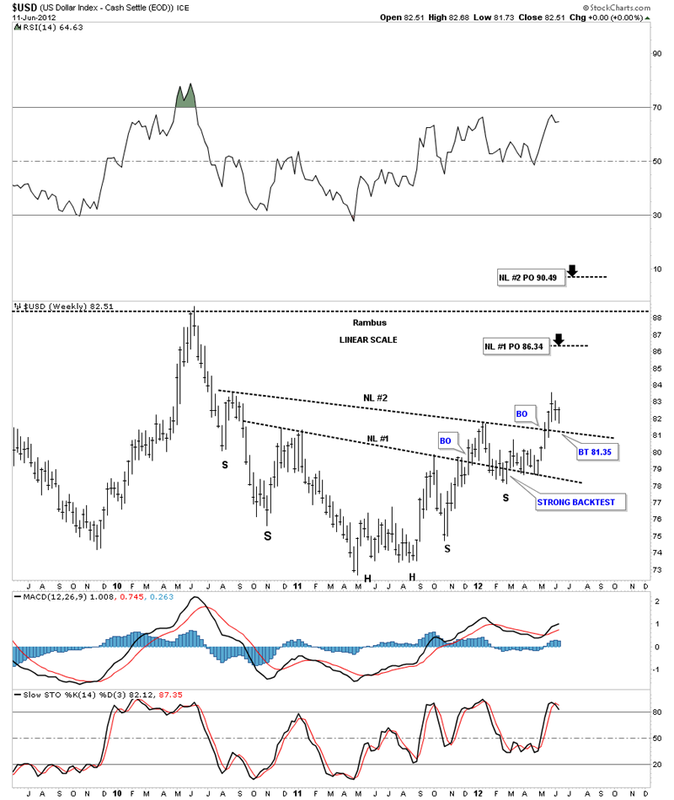 What I find interesting right now is gold looks like it has a H&S top in place while the dollar has a H&S bottom. It will be interesting to see if the two start to trade back toward each other and close the huge gap that is as big as the large gap from the 2001 – 2002 period. One thing is obvious and that is the dollar has refused to make new bear market lows since 2008.